Corned beef is a steal at this time of the year. And the leftovers are great for soup, sandwiches, etc. Take a 3 pound point cut, cut away the excess fat and soak in hot water for 2 hours to get rid of the excess brine taste, changing the water once. The glaze is 2 tablespoons olive oil, 1/2 cup brown sugar, 1/2 cup water and 1/2 cup of course ground mustard. Heat over medium heat for 5 minutes and then simmer to thicken. I get the grill to 450 for a start and then reduce gas so that it runs at 300. Brush on glaze over the cooking time. 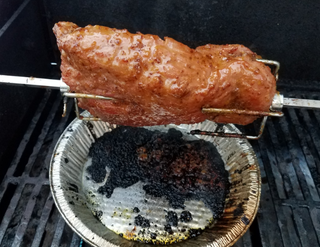 Cook 2 hours with a drip pan and let rest for 10- 15 minutes. It’s really good.